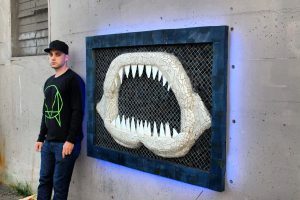 VTL member Wes just finished this amazing shark jaw using VTL tools! It took him a year to complete! Back-lighting is a nice touch. VTL at the Block Party! We were very proud to be a part of the E. 6th Block Party on the weekend! VTL provided tools and volunteers to help run a little planter box workshop. Fun! There will be hand tools, power tools, gardening tools, plumbing tools, and tool accessories! 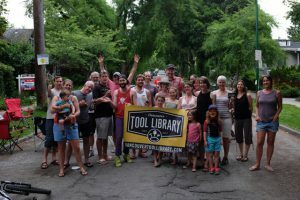 Come and get some cheap tools and help out your local Tool Library! This year, the VTL celebrates it’s 5th anniversary! Wooo!! It’s been a crazy, wonderful ride and we’re just getting stronger and stronger every year. We couldn’t have made it this far without all of our members. We’ve grown as a community over the past 5 years and we’re looking forward to the next 5! The VTL has opened a satellite location with a little help from our friends at MakerLabs. 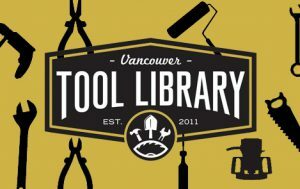 As of July 2014, this second inventory will feature some of our most popular tools at a more central location in Mount Pleasant, 221 East 10th Avenue. Stay tuned for updates as they come! 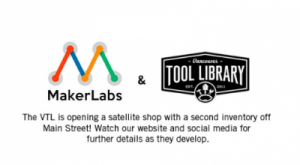 In the meantime, check out MakerLabs during their open hours.